B.A. 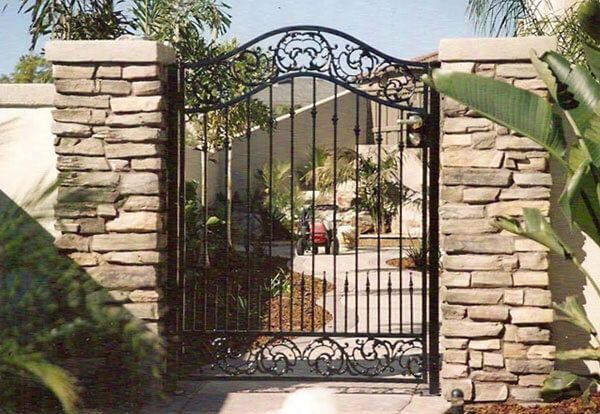 Ramirez & Sons Ornamental Iron Works, Inc. is your best choice for beautiful and affordable ornamental and wrought iron gates for San Diego residential and commercial properties. 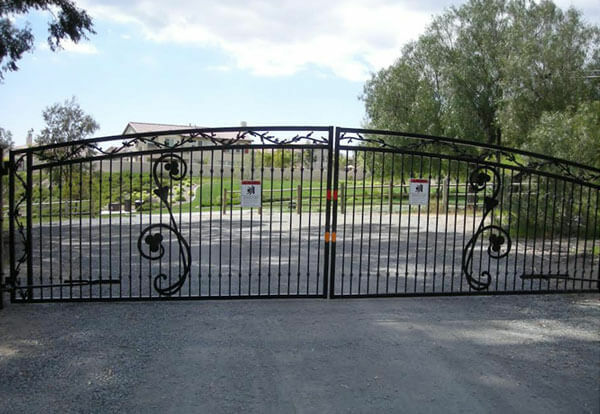 Over the last three decades, we've designed, crafted, and installed driveway access gates, courtyard gates, pedestrian gates, entry gates, and side gates. All of our gates feature high-quality materials and Old World craftsmanship, so that we can give you the best results possible. As a testament to our exceptional work, we have thousands of satisfied clients, an excellent reputation throughout San Diego County, and a high referral rate. With B.A. 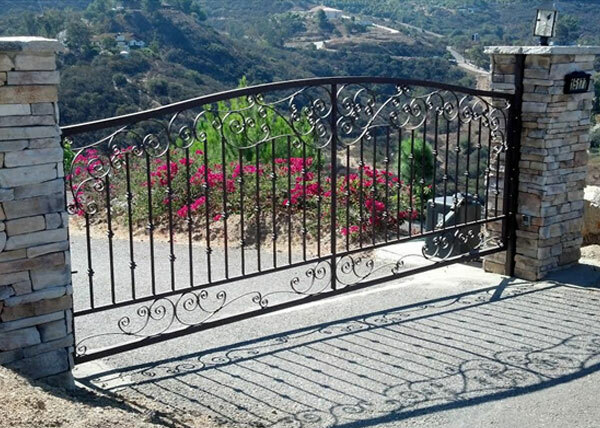 Ramirez & Sons, the options for customizing your iron gate are potentially limitless. 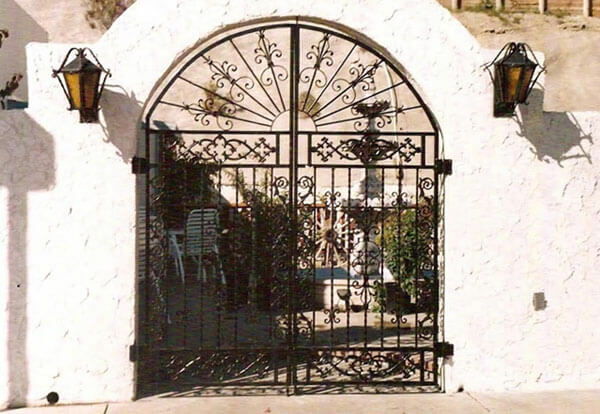 We can either replicate a gate you've seen elsewhere (in a magazine, on a website, or while visiting a castle in Europe) or help you design an original gate that is based upon the look of your home or business, your style preferences, and a selection of photos. 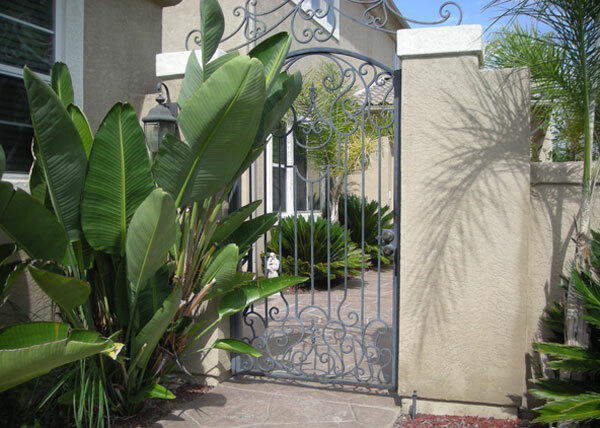 Our iron gates are made with medium- to heavy-weight steel that is heated and formed at our local facility in Chula Vista. Our hand-forged parts are then welded together and given the finish of your choice to achieve the color or level of rust protection you prefer. Call the ironwork specialists at B.A. Ramirez & Sons today. We provide free online estimates for those who can email us design idea photos and size specifications. All of our steel gates are competitively priced and backed by a two-year labor and material warranty. Most manually operated gate installations are completed in one day. To learn about our automated gates, click here. These are the smaller gates (typically 3' to 4' wide and 6' high, but could be as small as 4' x 4') that are usually attached to existing walls or fences and allow access into backyard areas. 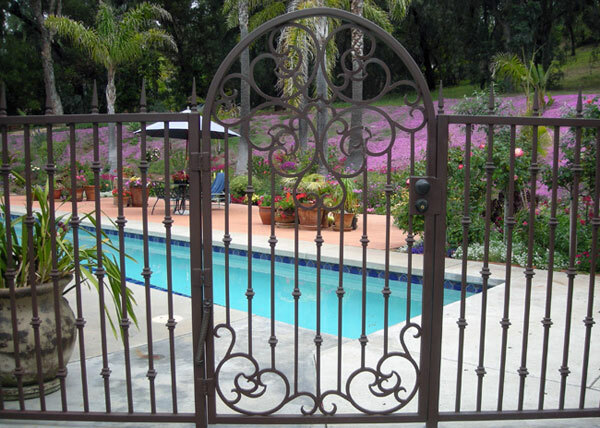 Gate designs range from Old World to modern. We offer tube steel and solid steel, and can integrate wood pickets. We can also add spears, scroll work, and forged or cast designs, such as oak leaves, rose leaves, squares, rectangles, and more. Controlled manually or with an access control system. Two-year warranty for both remodels and new construction. Entry and pedestrian gates are similar to garden gates but usually larger. They are typically installed at the front entrance to a home or business. 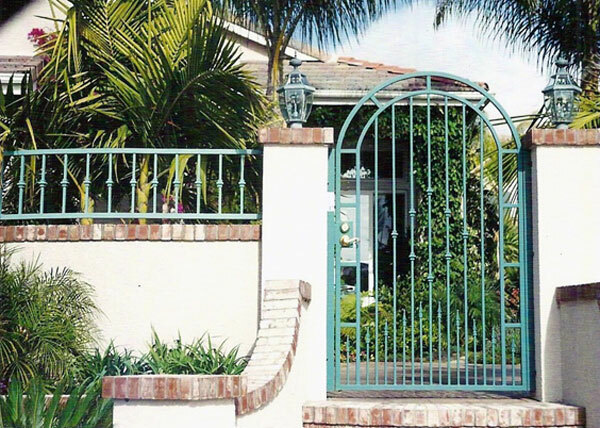 Gate designs range from classic to contemporary. We offer rolled to solid steel, and can integrate wood pickets. Can add spears, scroll work, and forged or cast designs, such as oak leaves, rose leaves, squares, rectangles, and more. Controlled manually or motorized, with option to add keypad, electronic locks, and more. Most apartment access pedestrian gates are located at main, side, and pool entrances. 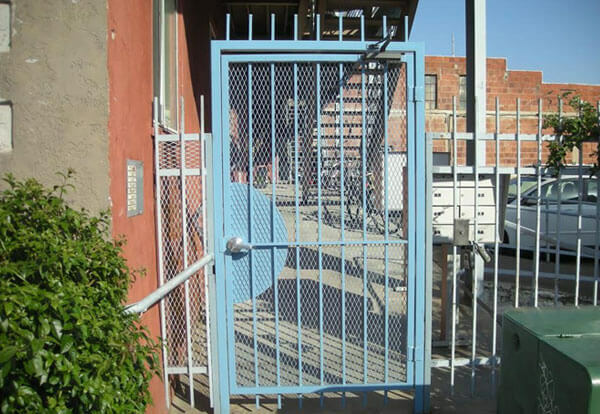 Typically feature heavier materials for the gate framework. Gates can be controlled by telephone entries that will ring in each apartment or condo or be directed to select smartphones. Design ranges from picket style to highly ornate. Can be made in any size and be installed between masonry posts or walls. When used for pool access, they are built to code, self-closing, and self-latching. 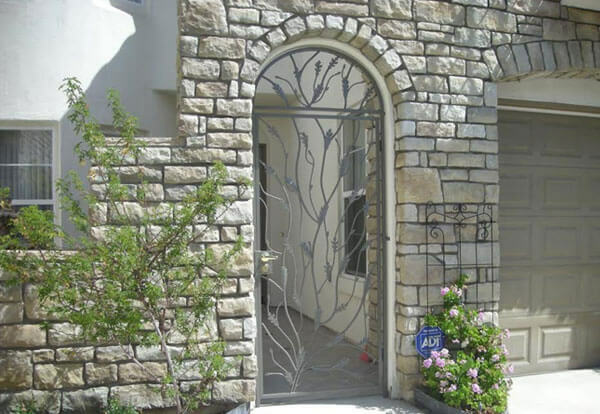 Our iron driveway gates are custom designed and fabricated. They can consist of single or double doors, swing or slide open, and feature motorized or automated access control systems. Designs range from the simple to the highly ornate. Option to add wood, copper, or brass backing for privacy or to create a truly striking look. Add a galvanized, metallized, and/or powdercoat finish to protect against rust. Other optional features include intercoms, card readers, fire strobes, and safety protections.